‘Dri-Guard’ is a simple, inexpensive product, for widespread use to prevent all but the most determined of highly equipped intruders from breaking the mortise locks. ‘Dri-Guard’ is a heavy duty steel, channel-shaped, mounting shoe, fitting over the leading edge of a door, with shield plates either side of the frame, fixed by through screw-bolts and powder coated finished in brown. Please note we do not supply the chain anymore. The guard can be manufactured to customer requirement. We at JML Hardware, are pleased to announce that we are sole suppliers and distributors of ‘Dri-Guard’ internal opening and external opening mortise lock shields. Crime against property is inexorably rising.Break-ins at your homes, schools, hospitals, commercial and office premises are becoming all too frequent. 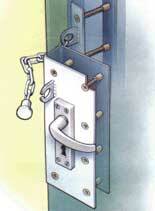 “Dri-Guard” is an improved mortise lock shield to prevent any would-be intruder from breaking and bursting the lock.